There are some things that exist solely in your peripheral vision. I find it fascinating that for most of our waking lives we concern ourselves with immediacies: what do I have to do today? Should I buy x not y? What will my wife think if I do n? Wasn’t there something I needed to do by 3.30pm? What do I need to get done next week? The old mind talk. Yet, there all the time, never leaping out sufficiently to become the star of the show, are all the fascinating objects, events, people in our peripheral vision. The supporting cast if you will. There is a psychological explanation for this – your brain, processing as it does, millions of pieces of data every day, has to prioritise. Most things get de-prioritised. They don’t help the important tasks of survival or mating or shopping. Then an event happens – someone points something out for example – and suddenly, the bridesmaid has a chance of being the bride. I spent my early years in the foothills of the southern Pennines. A large part of my family are from Congleton (‘Congy’ to those determined to make it sound even uglier than it does already). It’s a archetypal northern mill town. The Pennines rising up behind the town. Tall, thin, stoic mills, smeared brown and black with the grime of age still gripping the banks of the riversides. Houses, intermingled, in short, sharp runs of Ruabon brick and grey gritstone. Many of my family were mill people; my gran still bore a scar by her eye where a blurring shuttle had loosed and struck her. The mills were part of the weave and weft of their being. So it was for generations that the water towers, rising sentinel above the town, had formed part of their peripheral vision, just as they had for me. Born out of necessity on many fronts, but chiefly to ensure the local populace (read: workforce) were not decimated by diseases like cholera, water towers became a feature on the horizon of many towns across the British Isles. Funny then, that after almost 40 years, there were multiple events that crashed water towers from peripheral to primary vision in my life. It started with a chance encounter with The Renovation Man on Channel 4. Quite literally flicking through the channels one evening, the soft Geordie tones of the presenter eulogised the beauty of Victorian industrial architecture. I paused, assuming he was referring to a station or grand town hall. In fact, it was a water tower. Thinking little more of it, I hit record and went to bed. Saturday, two weeks later. My Saturday routine. Drop the children off at the dance & acting class, buy newspaper, retire to the library cafe; read, write, or think. And there, outside the window is the most impressive Victorian water tower you will ever see: five stories high; topped with mock Norman arches and simple crenulations. A stone plaque: ‘1866’. I had parked next to it for almost twenty years with barely a passing thought- only now after working elsewhere and seeing it less, did I stop and take it in. I went home the same day and found the recorded ‘Renovation Man’. 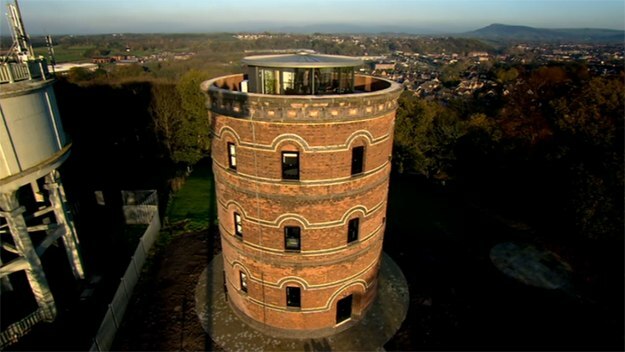 It was a fine water tower’ a beautiful cylindrical design with mixed brick work of red and blue and fine feature arches. A functional building but designed with the pride and attention to detail that today is deemed an expensive luxury. And I recognised it. Not with a vague familiarity, but a real sense of connection verging on déjà vue. In fact it wasn’t the water tower that drove this feeling, but the site and its sister; right next to it was a more modern water tower – a simple white structure; tank resting, shrouded in a concrete skirt resting on columns. Two towers, next to one another. This was Congy, the twin water towers standing out proud on one of the hills above the town and 40 years of peripheral vision became pulled into stark, sharp focus in an instant.